Private lessons are a key element of musical instruction. The majority of us are so used to the classroom experience, it’s easy to forget that 1-on-1 mentorship is the oldest educational model. Individual lessons allow the student to get guidance from a professional with the problem-solving and special techniques so necessary to the mastery of an instrument. This is a great resource for any music student regardless of age or level and is essential for those who wish to hone their playing to the highest level. Private applied lessons meet once per week for a fixed length of time, either a half-hour or an hour. This time is divided between playing and discussion. This is not just guided practice time. Unless the student is a total beginner, you should walk in the door with something ready to play. Remember it is YOUR WORK in the practice room is what makes you the player you are. A lesson or masterclass is an opportunity to discuss this work and get opinions from a master of the craft. Even a lesson with a great teacher who deeply inspires you will only effect change in your playing if you take their advice into the practice room. Lessons are about building skills and problem solving. Material covered in lessons will be tailored to individual needs and goals. 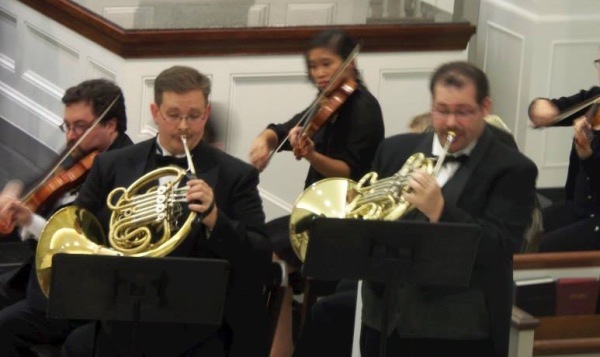 The curriculum will include exercises to reinforce fundamentals of musicianship and brass technique. Students will also work out of one or more “etude” (or study) books, collections of short pieces/exercises which are designed to teach certain concepts. The books used will vary according to the level of the student (undergrads, see “Curriculum Goals” below). Beginners should practice at least a 1/2 hour each day, 5 days a week. More advanced students should practice every day for an hour or more. Collegiate/graduate students should aim to practice 3 hours or more divided between 2 or 3 sessions. This is the type of regimen recommended by many professional players (see texts by Philip Farkas and Verne Reynolds). Remember that for effective learning, repetition is more important than length of time... for young students especially, a few minutes every day can be better than 2 hours the day before your lesson. The aim is not only to sound good the day of your lesson but to develop good habits so you will sound your best every time you play and experience continuing growth as a musician. students through the Music Department. Trial lessons for prospective students are offered free of charge. Masterclasses and other special workshops will vary depending on the nature of the event. Music: Students are responsible for purchasing music (etude books, solos, etc.) for use in lessons. Attendance/Cancelations: I should be informed at least 24 hours in advance if a student will miss their lesson, and will extend the same courtesy to you. Make-ups will be offered whenever possible in order to maintain regular instructional time. The semester grade for lessons is an assessment of the students attendance, preparedness and earnest improvement, and final jury performance (where applicable). The expectations of technique and specific literature vary depending upon the experience and academic level of the individual student. A Significant achievement demonstrated through the semester. Lesson attendance is consistent and timely. Materials are consistently prepared with few errors so student can add new material each week. Work focuses on musical style, nuance and phrasing. Clear improvement in overall facility and technique throughout the course of the semester and appropriate amount of literature covered. B Practice work and basic preparation is evident. Attendance is regular, occasional lateness. Errors exist in musical material but significant improvement is noted. Large portion of each lesson is focused on musical detail with some time devoted to correcting technique. Some assignments repeated. D Poor attendance or regular tardiness. No evidence or practice. Material is largely unprepared, frequent repeated assignments. Student is unfamiliar with large portions of material. Serious deficiencies exist in basic technique. F Does not follow prescribed program of study. Excessive absence. No evidence of practice. Material not prepared, even with repeated assignments. Extremely poor basic technique.